The Securities and Exchange Commission (SEC) is the government agency in the US responsible for overseeing and regulating securities markets, including the stock markets. The SEC was created in 1934 to protect investors and has since been tasked with preventing fraudulent activity in the marketplace, monitoring corporate mergers and acquisition action, and gathering and publicizing financial records for publicly traded companies. SEC filings are financial documents or other materials formally submitted to the SEC. Publicly traded companies, brokerages, and certain insider traders are required to file regularly with the SEC to maintain transparency. Most filings are then made electronically available by the SEC through the online Electronic Data Gathering, Analysis, and Retrieval database. SEC filings are particularly important for investors since a significant amount of trading action happens based on these financial documents. Who is Required to File with the SEC? All companies that are publicly traded within the US, whether or not the parent company is based in the US, must file financial records with the SEC. However, the filing requirement does not apply to most private companies with some limitations. Typically, private companies do not have to file unless that have more than 500 shareholders and more than $10 million in assets. In addition, companies that offer shares only within a single state do not have to file with the SEC. In addition to companies, brokerages must file their activity with the SEC. Inside investors of publicly traded companies must also file in order to ensure that illegal insider trading is not occurring. SEC filings can provide tremendous insight into the financial status of a publicly traded company, which in turn can inform trading action and assessments of share value. Although there are many different types of documentation that must be filed with the SEC, several filings are of particular note for traders. The registration statement includes critical information about the profitability and inside workings of a publicly traded company at the time of an offering. The registration statement includes a prospectus, which gives details about the company’s financial condition, the nature of securities being offered to investors, the company’s history and management, and analysis of potential future risks to the company’s profitability and growth. This prospectus must be audited by an independent certified public accountant to be valid. The 10-K is an annual report that must be filed within 90 days of the end of each fiscal year and typically provides much more financial detail than a company’s annual report. The report includes a business summary that describes operations, business segments, assets, marketing, and research and development in progress. The management discussion and analysis section of the 10-K explains the company’s future outlook, while the report can also include the company’s balance sheet and income and cash flow statements. These data can be particularly useful for evaluating the long-term outlook of a company. The 10-Q report is similar to the 10-K report but is filed quarterly within 45 days of the end of each of the first three quarters of the fiscal year. Although this can be a good update for investors in between 10-K filings, the financial statements are typically not audited and the report includes less detail about operations and outlook. 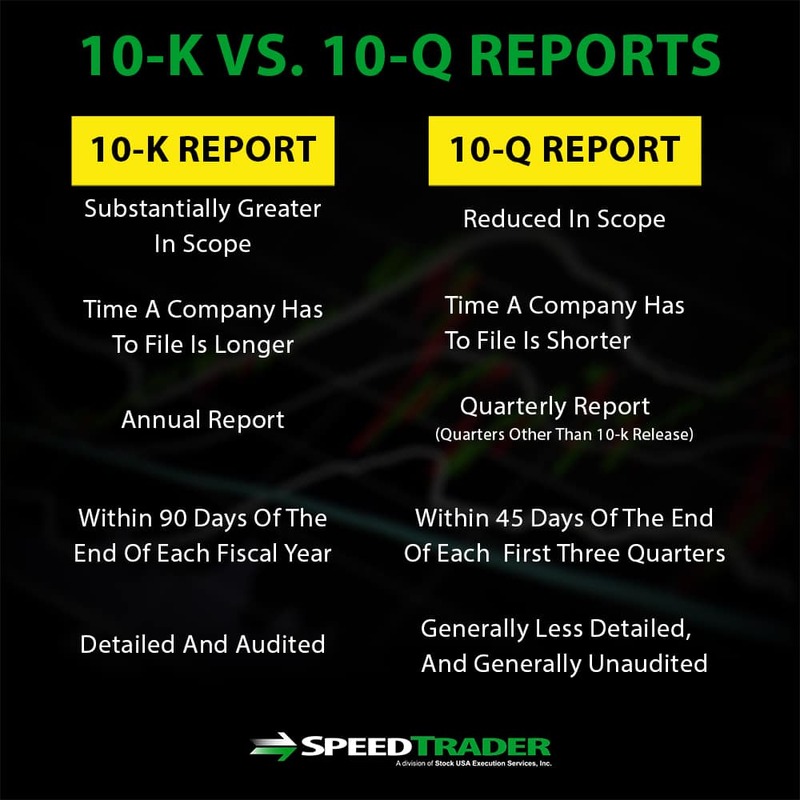 Important business developments that investors need to know about but that occur in between 10-K or 10-Q filings are detailed in unscheduled 8-K reports. Bankruptcies, material impairments, acquisitions or depositions of assets, and appointments or departures of executives are common events that trigger an 8-K filing. The reports typically contain details about the event, relevant financial data, and press release information to notify investors. For active investors that listen in on shareholder meetings and exercise their vote, the proxy statement can be an important document. This statement includes information about compensation, bonus plans, and perks for executives and managers as well as details about the managers’ histories with the company. The proxy statement can also be used to detail proposals for additions to the company’s board of directors and disclose potential conflicts of interest. 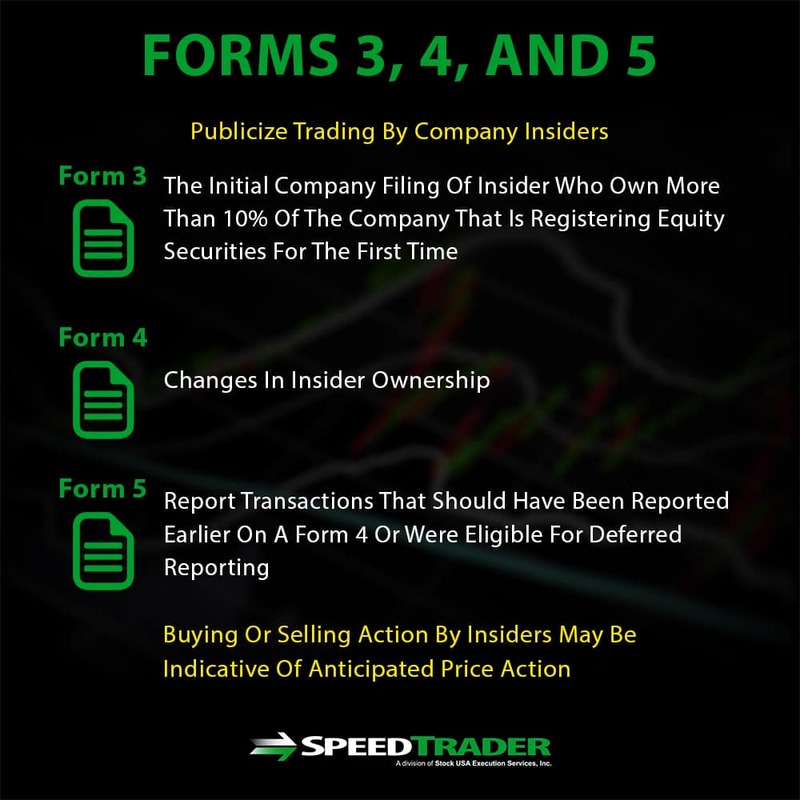 Forms 3, 4, and 5 publicize trading by company insiders. Form 3 is typically filed following an initial public offering as company executives and shareholders who own more than 10% of the company make their first transactions. After these initial transactions, Form 4 is typically used to disclose trading of company stock by these insiders. Form 5 is an annual report that discloses and insider trades that were exempt from Form 4 reporting. These reports are critical for traders since insiders often have the most information about the future outlook of a company and buying or selling action by insiders may be indicative of anticipated price action. The Schedule 13D form is filed by an individual, group, or company that purchases 5% or more of the voting shares of another company. This form announces to both the purchased company and the public who the new beneficiary owner is and their contact information. For traders, Schedule 13D forms are significant because they can indicate that a hostile takeover, proxy fight, or another potential change may be coming, which can dramatically affect stock price. Form 144 is filed by a company’s board members, executives, or affiliates when they plan to sell more than 5,000 restricted shares or $50,000 worth of restricted company securities in a 90-day period. Restricted shares are typically those that were offered prior to the company’s initial public offering. These notices can give investors clues to selling pressure mounting on the company or its executives. Companies are frequently filing records of their financial operations and future outlook that can provide investors with important clues to how the company will fare into the future. Due to the important information these filings reveal, SEC filings can also have a big impact on stock prices as soon as they are released. 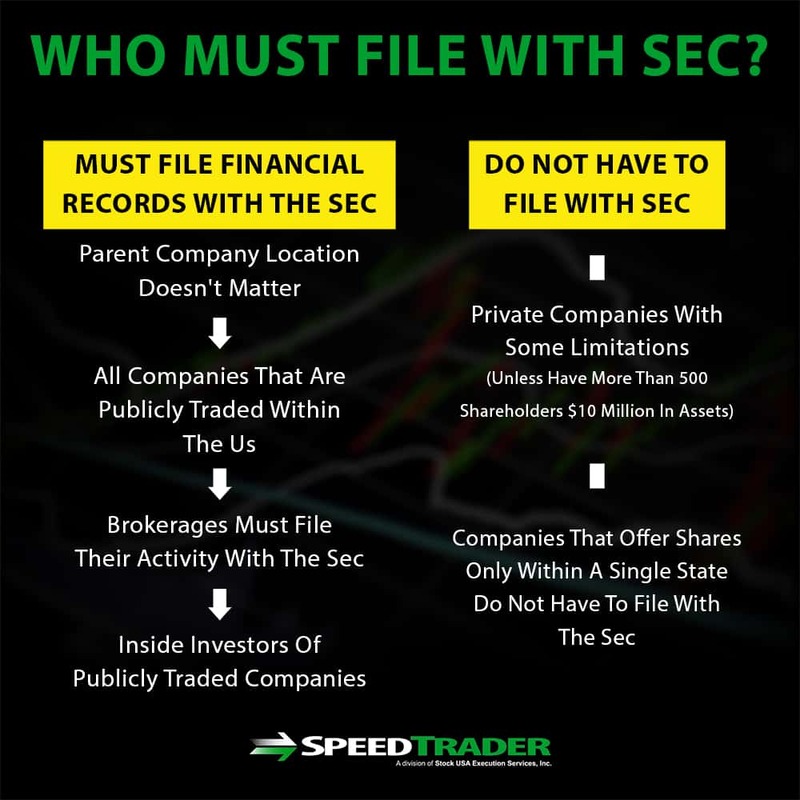 As a result, SEC filings are relevant to not only to long-term investors, but also to day traders – so all traders should be familiar with the most common SEC forms that companies and executives are required to file.